We hold expertise in offering a superior quality Hydraulic Powerpack Continuous Casting Machine. The offered machines are developed by the professionals, which make use of latest technology and advanced machines in manufacturing. 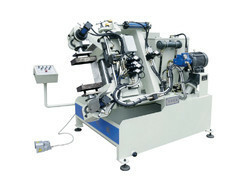 These machines are widely used in steel industries and footwear machines. All these machines are quality tested on varied parameters, before the final delivery. - Capacity: 4/7, 6/11, 9/16 & 10 Mtr Radius. By keeping track with contemporary market growth, we are captivated in offering our customers an exceptional quality collection of Continuous Casting Machine Withdrawal Straighter. These products developed and manufactured by using supreme-grade basic material and contemporary technology as per set market norms and guidelines. The unique concept of the new generation horizontal continuous casting machine, where controlled flow of molten metal directly from the bottom of the core less medium frequency Induction Melting Furnace, taking shape and solidifies in partly heated and partly water cooled graphite die attached horizontally with the furnace, and pulled by the withdrawal system.